Looking for last minute dessert recipes for Easter? 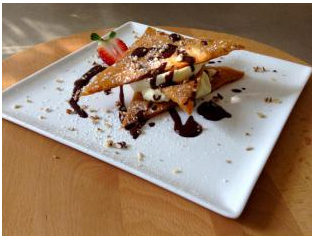 If so, check out this yummy dish: Lemon Mousse Napoleons with Chocolate Sauce from by Paulding & Company— a full catering kitchen based in San Francisco, founded by mother-daughter duo Tracy and Terry Paulding. The Lemon Mousse Napoleons with Chocolate Sauce are not only a tasty treat packed with-tons of flavor, but will add luxury to your dinner table this Easter Sunday! The beauty of this dessert is that all the components can be made in advance, and all you have to do to serve it, is assemble. It looks complicated and long, but each step is quite easy! Will make 4 servings. Preheat oven to 350°F. Toast the pecans for just 2-3 minutes on a baking sheet. Let them cool, mix ¼ cup with the sugar on a cutting board, and chop very fine — you can also use a mini-processor for this task. Coarsely chop the remaining two tablespoons nuts, and reserve for garnishing the dessert. Lay one sheet of phyllo on a cutting board. Brush with melted butter, sprinkle with half of the nut-sugar mix, then top with the other sheet, pressing down lightly. Butter the top sheet. Cut the stacked sheets in half cross-wise, then sprinkle one half with half the remaining nut mix, and top with the other half-sheet. Refrigerate the stack for a little while before continuing, to firm up the butter (maybe 10 minutes). Remove from the refrigerator, and cut the sheet in half lengthwise. You should now have two 9” by 7” rectangles. Cut each into two 9” by 3 ½” strips. Cut each into 6 triangles, as even as you can. Transfer these onto a parchment-covered baking sheet, spacing them out. Cover with another sheet of parchment, and another baking sheet, to weigh the triangles down. Bake until golden, checking after about 7 minutes, and continuing if need be, for another minute or two. Remove the top parchment, and let the triangles cool. May be made a day or two ahead, store in an air-tight container. Do not refrigerate. Combine the zest, juice and sugar in a saucepan and bring to a simmer. Beat the eggs until light. Beat the hot lemon mixture slowly into the egg. Scrape back into the saucepan. Cook, stirring constantly and reaching all over the bottom and sides of the pan, until the mixture barely starts to simmer around the edges, plus 15 seconds more. Pour through a strainer set over a bowl. Stir in the vanilla. Cool completely. May be made up to a week ahead, and refrigerated. Before putting together the dessert, whip the cream and fold into the curd. Combine ingredients in a bowl over simmering water until just melted, stirring. Let cool. May be refrigerated up to a week. Rewarm to serve, by placing the container you’ve stored the sauce in, into a bowl of hot water, or placing the sauce in a bowl over a pot of simmering water for a minute. Drizzle four plates generously with warm chocolate sauce in a zig-zag pattern. Put 1 crisp on each plate. Top each crisp with 1 heaping tablespoon mousse, then layer with another crisp and tablespoon mousse. Top with another crisp. Sprinkle reserved chopped nuts around napoleons. Top each with a small drizzle of chocolate sauce. A judicious sprinkling of confectioners’ sugar may be added. *Note: the lemon curd is adapted from one in Chocolate and the Art of Low Fat Desserts, by Alice Medrich. Most lemon curds have butter, hers doesn’t. With the added whipped cream, I prefer this version. The curd, without the cream, will keep for a week in the refrigerator.